The humble toasted sandwich has always been a staple in my household. It was one of those things you could make with whatever happened to be in the fridge over the weekend, or something to make that was valuable procrastination when exams were coming up. Being not the most original in recipe, and usually having little else in the way of ingredients, these sandwiches were generally cheddar and ham. Oh boy have I been missing out! 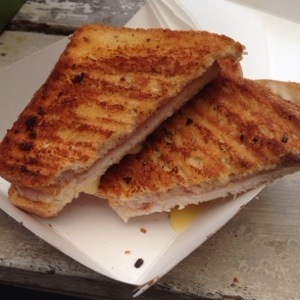 There is so much more to a toasted sandwich then ham and cheese and I will be forever grateful to Toastface for helping me realize the true potential of the toasted sandwich. Toastface Grillah is located down Grand Theatre Lane off the Murray street mall, and can be entered before the cafe and after the DFO beyond the arcade where Woolworths is located. 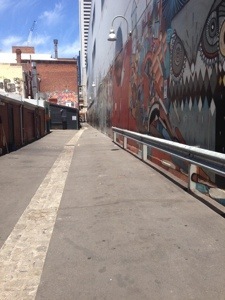 Essentially go through the lane way and keep walking until you can smell the delicious cheese and toast. This will be past all the beautiful street art, and the less arty and more derelict section of the lane way. If you come from the mall Toastface will be on the right hand side just before you hit Wellington St. I’m convinced that such a quest to reach the perfect toasted sandwich is a challenge to test your dedication, and ensures Toastface is only populated by those initiated to where the hell it actually is. In most people’s case this occurs when a friend or co-worker drags them down the lane way with the words “you absolutely have to try this toastie!”. The destination is quaint and homely, Toastface has a very small premises with a lovely courtyard, filled with mish-mashed furniture and cushions. Its beautiful on a summers day to sit and watch the world go by. When we went last there was even entertainment in the form of a chill dude playing the ukulele (completely of his own and very awesome accord). 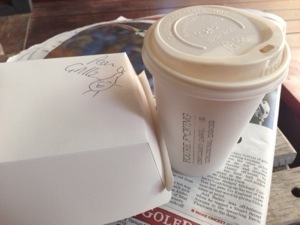 I know what you’re thinking – toasties were promised and thus far all I’ve heard has been about finding the damn place! But I think you’ll agree that this is very much worth the wait to adequately set the scene because frankly food tastes better when you’re in a space and atmosphere you enjoy. 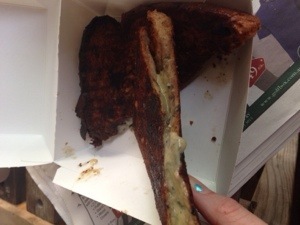 My original favourite toastie over a few visits is definitely the pear grillz. This combines blue cheese, with pear, lime chutney and delicious raisin toast. The combination is absolutely perfect, sweet, oozy, cheesy goodness. The raisin toast goes quite dark due to the sugar content, so despite the burnt appearance it’s actually cooked perfection. For those who don’t like blue cheese, you will love this! The pear balances the sharp blue cheese and the sweetness of the raisin toast and chutney. It’s an absolute must try! Next was the very Christmassy turkey, cranberry and Brie toasty. It’s such a great traditional mix of flavours, perfect to get into the spirit of the season. The outside was cooked to golden brown perfection. The cheese inside ensued the turkey stayed moist and delicious, while the cranberry added a beautiful pop of sweetness. My only wish was for a little more cranberry! The rest of the filling was so generous it’s a shame there wasn’t more cranberry to go with it. The Danny Zuccho is also delish, and temptingly golden brown. 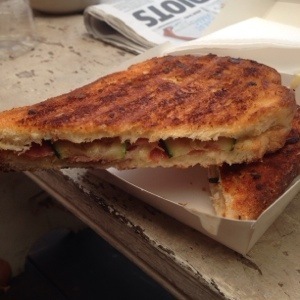 It contained Brie, zucchini and prosciutto for a killer toastie. The zucchini is cooked perfectly, soft but not overdone. The Brie was soft, gooey and delicious with the salty prosciutto. Some people may find it a little too salty and overpowering with the prosciutto and may prefer ham or bacon, but it really comes down to personal preference. And while we’re here the coffee is also fantastic, as is the iced coffee on a super hot day (as Perth has been far too often of late) where you can sit outside. Though not air-conditioned the little courtyard is nice with a little cover and a breeze, and is actually much better then being inside. 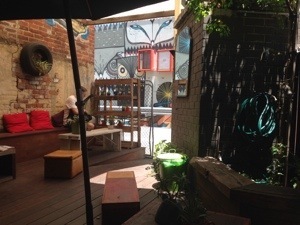 Check out this awesome little spot when you get the chance, and soon as you do I guarantee you’ll be the one dragging people down the lane way to their first taste of pure toastie bliss! Been to Toastface yet? What’s your fave toastie? 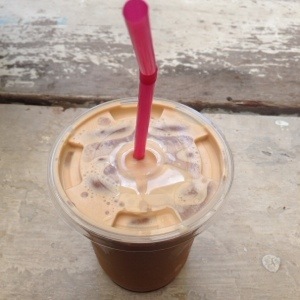 That iced coffee looks great, I’ll have to check it out!